SAVOR THE DAY: From "Looking" to "Finding"
One day when I was about 13, my mom hollered to me, “Come on! Let’s go find a home.” The house we’d been renting was being sold from under us and my parents had unsuccessfully been looking for a place to buy for months. As if guided by a greater force, my mom drove across town without really knowing where she was going. We ended up in Greenlake, a pretty neighborhood with an urban park and lake. When we parked the car, we immediately noticed two houses side-by-side, both for sale. Although neither was perfect, they both fit our needs. After touring them both, my parents ended up purchasing the one with the smaller lot but larger living space. 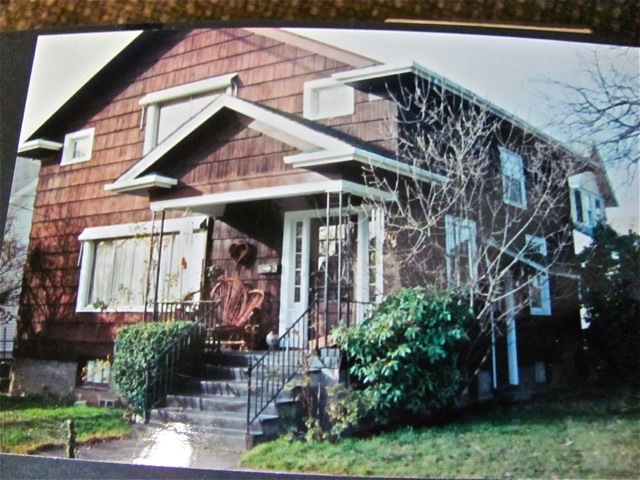 We lived in that house throughout my high school and college years, and when I think back to my childhood in Seattle, this is the house I remember. As soon as we stopped looking and started finding, the right house appeared. It’s the same with dating. I haven’t found my Mr. Right because I’ve only been looking, which has suited me quite well. I’m a champion looker. For example, it takes me days, sometimes even weeks, to plan a vacation. I leave no stone unturned while searching for the cheapest airfare and the best hotels. And now that my parents are property hunting again, I’m on Zillow and Craigslist every night looking for their new home. I send them listing after listing, simply because I love the pursuit. Although I’ll be happy when they find something they love, I’ll also probably feel a bit bereft because I won’t be able to look anymore. For all my moaning about wanting to fall in love, get married, and start a family, I think I’ve actually been in love with the process of looking. I don’t think I was necessarily ready to find. Although I’ve been saying for years that I want to settle down, I’ve enjoyed how being on my own has made it easier to travel, move from city to city, and even test out a few different careers. Plus, I even think blind dates are kind of fun. I revel in adventure, and I love having a good story to tell. My Internet blind date escapades have made for great stories, which I’ve used to regale many a crowd. Additionally, I’ve enjoyed the role of online dating “expert” and helping friends navigate the world of creating a dating profile and connecting with strangers. Over the years, I’ve often used my location to explain why my ideal match and I haven’t found each other. For example, I reasoned that the men I met when I lived in Maine were too outdoorsy, the men in Los Angeles were too citified, and the ones here in Paso Robles were too country, but the truth is…you can find the love of your life anywhere, when you’re ready to find. I like being autonomous, and I enjoy the pleasures of living alone, but also my heart yearns for a family. Change seems to be in the air, and I think part of my transformation this year will include moving from the place of looking to the place of finding. I’m ready! If, like me, there’s something in your life you’re yearning for, such as a relationship, a home, or a new job, consider giving up the search. Change your mindset. Go on the offensive and find, just as my mom and I did with our house so many years ago. Miracles will abound! Here's to finding your heart's desire! May miracles abound! I wanted to share a new and exciting recipe with you, but it seemed the more I looked, the less I found. So, I decided to change my approach. I opened my refrigerator and rather than looking, I decided to find just the right ingredients. This is what I came up with. I hope you enjoy it as much as I do. To make the marinade, mix all the ingredients together in a medium bowl. Add the chicken and stir to combine. Cover with plastic wrap and refrigerate overnight. To make the green sauce, combine all the ingredients together in a blender and process until smooth. For a spicy zing, add green chili pepper, such as jalapeño. Preheat a gas grill on high. Reduce heat to medium and oil the grate. Place the chicken on the grill and cook, covered, about 10 minutes on one side and 5 minutes on the other. The time will vary, however, based on the temperature of your grill and the size of the chicken thighs. Serve over jasmine rice and drizzle with the green sauce and a splash of Sriracha (if you so choose). wonderful story! very wonderful. It is good you realized that. I wonder if people who marry and continue to pursue relationships while with someone else are indeed still in the looking stage and did not comfortable fit into the "I found it" stage. I knew someone like that. and now he has no desire for anyone else other than the partner he is with. I thought he could never change being a seeker. Great guy just kept seeking even though he had a partner. ps. the name that appeared is part of my gmail email name. I am really Gina Sanacore. I have loved to look for careers. I have been looking for a job for years now. I enjoy the adventure of finding that perfect career. I still haven't found it. In fact, my current job found me! I just realized that! Thanks for this realization. I totally get it now. Great post Meadow. I have always had the belief that you can find your true love anywhere, and this has proven true for me! I met Jeff while volunteering at a Rodeo in Armstrong, after being fired from my 2nd spa job in less than a year, for no particular reason. I had prayed for the angels to bring me a partner that would be "good for me", and my mom showed me the ad as I arrived back at my parents house. I met him in the VIP tent. He was volunteering too. I just knew I had to meet him. I think my angels whispered very loudly in my ear. It reminds me of the Yoda quote, "There is no try, only do or not do". I am going to use this inspiration to find the next great job and place to live for us, I know it will happen! Have a great day! You are exactly where you need to be. I LOVE this post, it's just where I'm at with similar tendencies for "looking". I revel in looking for things for friends......houses, cars, plants, clothing, you name it! Haha, I'm single and have been 'looking" for years and I too have stories of blind dates and internet adventures. Goodness, this really has opened my eyes. Thank you Meadow and good luck with finding! How well you have written what I've thought and never said. Thank you Meadow.